Infrared heaters and infrared heating panels are becoming more and more of a popular form of heating in France, whether as a primary heating source or a supplementary heating source in the property. With infrared panels having taken off in Austria, Germany and the Low Countries in the last 5 years, word of their fantastic benefits has spread all the way to the UK and France, where we are seeing more and more customer adoption. When we talk about infrared heating in this blog, we refer to ‘far-infrared’ heating rather than near infrared heating (like halogen heaters), which you may sometimes see in commercial premises in the UK and France. Far-infrared uses infrared light to heat solid objects and the eyes can’t see this, unlike with near infrared, which glows as it heats. 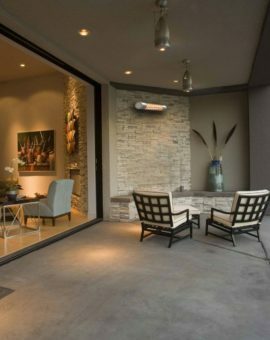 Adopters are liking the direct, gentle heating output and the sleek design of the infrared heaters; therefore we are likely to see phenomenal uptake in the coming years. New adopters have to be careful though, as it is best to carry out all the possible research prior to adoption, and we take a few moments to explain some of the challenges if you are trying to do so for a French property, based on our experience and other customer feedback over the years. The UK provides very competitive natural gas, and whole-house central heating systems are quite common in most of the properties, with gas as the fuel of choice. In France, the cost of natural gas delivered to individual properties is more expensive (due to various reasons including the taxation system to supply), and the fact that a high output of power comes in the form of nuclear energy generated electricity. 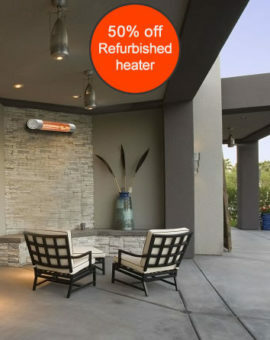 Therefore, in many properties, it is not uncommon to find heating in the form of storage heaters or electric radiators. In some of the more traditional and rural properties, wooden furnaces or log burners are used throughout the properties, as well as oil boilers working with a central heating system. But as you may well appreciate, oil is not a very pleasant fuel to deal with and is terrible for the environment. Finally, you may have a really weird heating set-up in your France property, particularly if heating was never incorporated into the traditional design. I have seen some real humdingers in my time – the worst being Calor gas combined with plug in electric fan heaters. I remember how uneasy I felt firing up the boiler in the front room: at the same time feeling too hot in one part of the room and absolutely freezing in the other part. If this reminds you of some your holidays, then you will know what I mean. 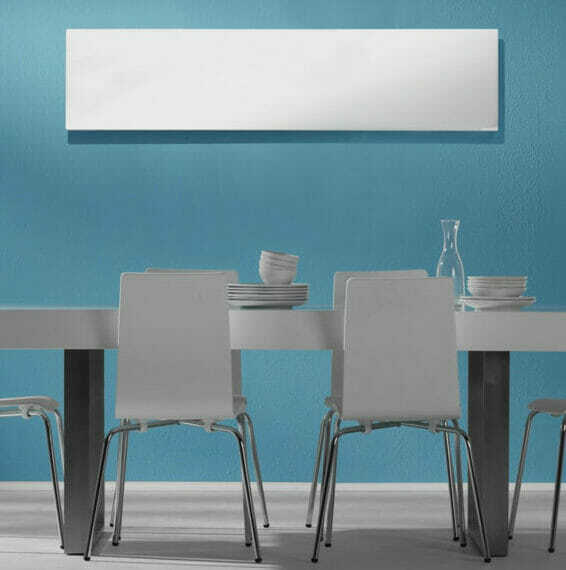 As infrared heating manufacturers and designers have tended to come from Europe, the output of the panels has been designed for the European consumer market. Therefore, unless you are buying from a UK manufacturer, the infrared heating panel will come with a European plug, which can be plugged in straight away to your circuit in France and it is ready to go. However, you may want to wire the panel into the circuit it doesn’t matter if the panel comes with a UK based plug or a European one, as the voltage rating of the appliances is the same. So, the electrician will cut the end of the plug and wire the panel into the circuit. Along with this installation, the panels maybe wired to a switch or a programmable thermostat to achieve zonal heating, which we discuss in more detail later in this article. We would advise against installing them yourself unless you are familiar with the electrical standards for low voltage appliances or the NF C15-100 standards. If you are searching for a qualified tradesman, make sure they are set-up with a Système d’Identification du Répertoire des Entreprises et de leurs Etablissements or with a Siret number. While this isn’t an indication of their quality, at least it is a start in terms of employing someone who is actually registered to do building works in France. Always get references if possible or ask neighbours for recommendations. I, like many folks out there, absolutely love holidaying at a chateau or traditional property. While in the summers heating is not really an issue, whenever I stay late in the year or in the spring, I always require a bit of heating just to keep the place nice and cosy during the evening and early mornings. Many of those places have traditional log burners, with some form of plugin electrical heaters. I find particularly in those months that some of the rooms in these homes just don’t tend to get enough heat and as a result they can attract mould. Convection currents don’t always reach every room as some of them are closed off and it would be expensive to heat every room with plugin electrical heaters. Also, plugin electrical heaters may make your environment too uncomfortable – as they are extremely hot nearby but not very effective when you open that room and the heat quickly escapes. In these situations, the infrared heating panels are the perfect solution. Not only do they run effectively at a fraction of the cost, they are also a form of dry heat. If you have mouldy walls or if some of the rooms you couldn’t heat because of the cost but you really need to, then infrared heaters are the perfect solution. Infrared heaters when they are turned on for a period of time will literally target the cold spots in those rooms. Therefore, as long as you have sized up the rooms correctly, and have mounted the heaters correctly on the walls or the ceilings, then the dry, targeted heating will work effectively with those walls. The gentle heating output should reach to every part of the room, and won’t make you feel stuffy and uncomfortable, which you will sometimes get when with convection heaters. Rather than moving the moisture in the room, it will eventually dry it out with infrared. The final benefit I always find is that when you are heating a room, but want to open up the window, by doing so the room loses all the retained heat very quickly. This is the issue with convection heating. However, infrared heating actually acts as a thermal store within the fabric of your building. When it turns it starts to be absorbed in the environment of the rooms, i.e. the walls and the floors. Eventually, when it has been working for a while, those walls actually reach what we call the thermal mass. Therefore, as the heat is stored in the fabric rather than in the air, you will find that if you need to open a window and let in a bit of fresh air, your rooms will still retain heat. Your home in France is stylish and so is the infrared heating range! 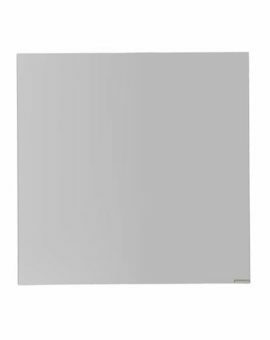 Infrared heating panels come in different sizes and finishes. For example, they come in the plain ‘mat’ or carbon fibre finish; or the glass finish; or mirror. The plain carbon fibre can be framed or frameless. We can even offer printed, high-resolution pictured panels, either with our fantastic range of stocked picture panels or using a photo of your choice, which is then printed onto our panel with a high-resolution printer. 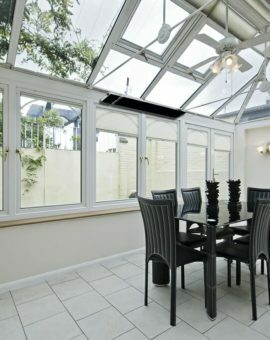 Therefore, if you after the most stylish look for your home, we can work with you to achieve the best possible solution. Many of our past customers have told us about their dream second homes in France, but then the challenges of maintaining it throughout the year. Some however use the second homes as supplementary secondary incomes by renting it out most of the year, and holidaymakers like myself love to visit some of these fantastic properties from the UK. Landlords are often concerned that holidaymakers will turn the heating right up without any care for the consumption and costs of running the heating during their stay. 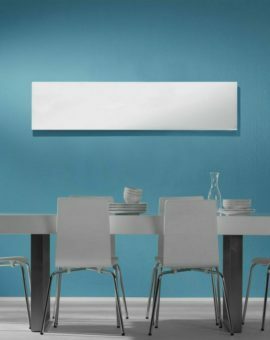 With infrared heating panels, they can be wired into the circuit and either as standalone to a receiver/thermostat or together with other panels – with the aim of heating larger rooms or zones. This allows for greater efficiency. Infrared heating works amazingly well if you are trying to achieve zonal heating. Zonal heating can either be heating a specific area of the room, or could be heating a specific room like your kitchen, bathroom or living room. As infrared rays need to travel unimpeded to heat physical objects, this makes them different to convection heating which heat the air that fills the room. Therefore, if you have a property with low ceilings and a property filled with lots of furniture, then you really need to be careful how and where you place the infrared heaters, as this could determine how efficient and effective they actually are. If they are positioned correctly and sized appropriately, then all you need to think about what level of thermostatic control you would like to achieve. You can install the latest app based thermostats than will work with your smart hand held device or tablet. Therefore, you could be putting your feet up in the UK, whilst monitoring the heating consumption and levels used in your property in France. It does sound like overkill, and you may want to educate your tenants about the thermostats and how to use them as they come to visit your property. French properties are diverse, so sizing infrared heaters is crucial! As mentioned before, the type of properties you can get yourself in France is a real diverse mix – from the traditional stone wall properties, right to more modern pre-fabricated dwellings. With each different property type, it will determine the useful heating output you require from your infrared heaters. 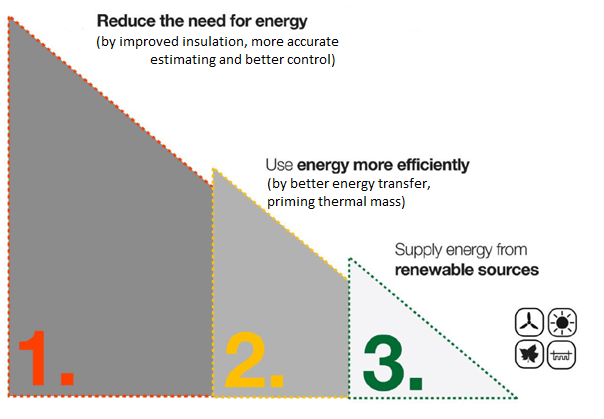 On new buildings, both in the UK and France, the energy efficiency standards are quite high as both of the countries have signed up to the European Buildings Directive, which has steadily improved the quality of energy efficiency in domestic and commercial buildings. Therefore, for a new build we recommend about 60 watts per m2 of heating output, and on some period properties the output requirement can be as high as 150 watts per m2. If you are unsure about how many panels you need and you need help with sizing the system, it is best to get in touch with us directly and we can help pull together a quotation for you. The infrared heaters can be used as a supplementary heating source or they can make up the full house solution. It really depends on what you are trying to achieve. They (the infrared heaters) would be much cheaper to install in a room which has central heating radiators, but may require another one on the other side of the room. 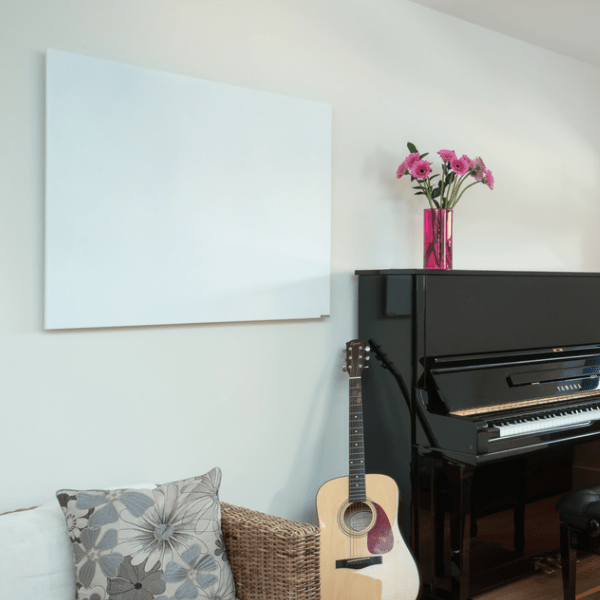 Actually, to wire and programme your infrared heating panel would be much easier than to lay additional pipework and install another radiator – so infrared install is hassle free and quick to put in place. If you already have gas central heating or a condensing oil boiler powering the main heating source it is probably not worth ripping all of this out and getting infrared heating installed throughout. However, if you have a real mish-mash of a heating system, or none at all, then infrared heating would be a viable option to consider. 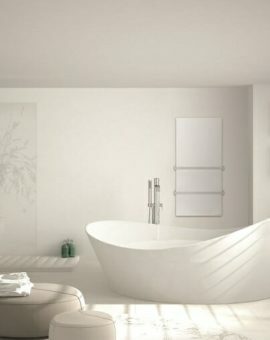 How does infrared heating with bathrooms and wet rooms? 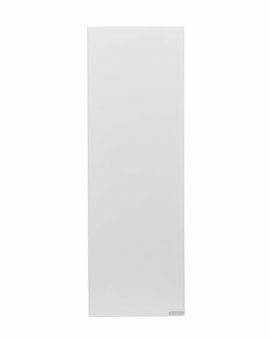 The infrared heating range is IP rated, which is a common standard that allows for installation in wet rooms or bathrooms. In terms of the installation side, we again recommend you seek professional advice and installation as electrics and bathrooms with the water and vapour elements are just too risky to try and work around on your own! Typically, the infrared panels are installed to a switch rather than thermostat as it is tricky to find a thermostat that satisfies all the IP requirements. Once you have sorted out the tradesman for the works, then you need to pick out the sizing and type of heater that would fit into the surroundings. 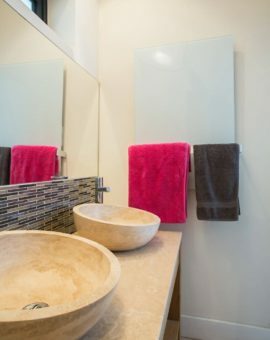 In the UK, we normally don’t like our bathrooms too warm, therefore a smaller heater may be sufficient, but once you are on the continent the culture changes and there is a requirement for much larger heating output. It is not bad idea to have an oversized infrared panel, as the room would get to temperature much quicker, so you can turn it off. 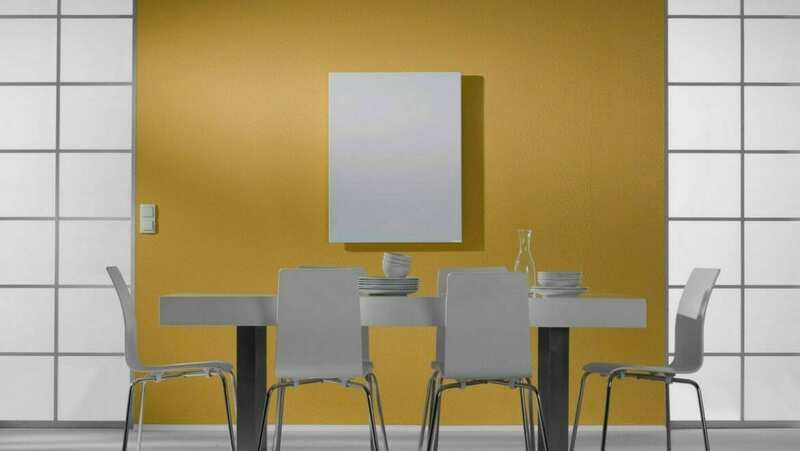 A mirror panel, which acts as heater maybe the best solution for you. 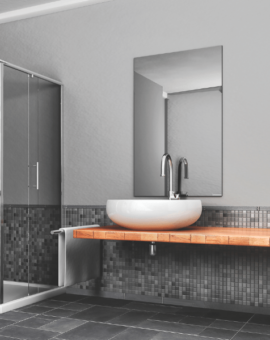 Mirror panels are fantastic as not only do they serve that purpose, but with the heating element will mean that they don’t steam-up if you have just showered and you need to shave or use the mirror as you are getting ready. Where else can I use infrared heaters? We recommend the normal infrared heating panels. The sizing and output requirements will vary and best to come to us with your requirements so we can offer the appropriate advice. Rooms with extremely high ceilings are extremely tricky to heat, this is why the Pulsar range absolutely satisfies this requirement. The heaters look extremely style (hence blending into the surroundings), are suspended off the ceiling to target an area below that has the work-tops or office desks, where the staff sit. 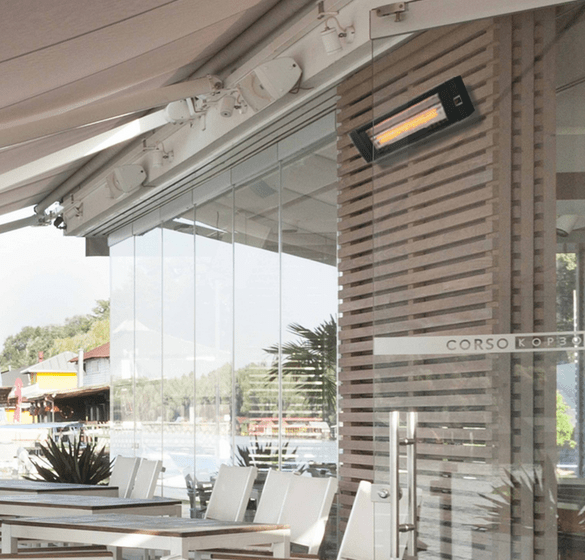 You may have a patio area in your property or commercial premises and we can offer patio heating solutions that would make these spaces much better to use during those chilly months. Great for smoking areas for your staff. Please note: if you are a business with a French VAT number that is approved via the EU VIES scheme we will take the VAT off your order. If you are the end user and purchasing from us, you will have the pay the normal UK VAT rate for the products. We get a lot of queries from UK expats or owners of holiday homes in France looking for the perfect infrared heater for their property. Since our start a few years ago, we have helped 100s of consumers all around Europe, and not just France. So, if you just need a bit of advice about infrared heating or you are a bit further down the line and you need help with sizing your rooms, then please get in touch and we can help.